Not everyone likes having to travel to get a professional massage everytime they want to loosen up their tight neck and shoulders. Not only that, but having to pay over and over again can become very costly over time. Wouldn’t it be great to pay once and be able to experience it from the comfort of your own home? Electric neck and shoulder massagers are a great option for anyone who wants to enjoy the benefits of a spa-type massage in their own home, office, or even when on the couch watching TV. Also, our editor loves these massagers and details his personal experiences with them in this article. But first, we’ll briefly discuss the benefits of such devices and what features you should be looking for in a neck and shoulder massager. Why Use an Electric Neck and Shoulder Massager? Numerous studies have confirmed the effectiveness of Shiatsu massage – a Japanese style of massage that involves rubbing, tapping, squeezing, and applying deep pressure to muscles – in treating neck pain. New research now suggests that proper timing is the key to maximizing the benefits of massage therapy. In a 2014 study, researchers at the Group Health Research Institute in Seattle compared improvements in neck pain between 228 men and women who received either one, two, or three 30- or 60-minute massages per week, and a control group who received no massages at all. The participants who received three 60-minute massages weekly showed the most improvement after four weeks of treatment. Electric neck and shoulder massagers are designed to mimic the deep kneading action of a Shiatsu massage performed by a professional therapist. While these devices are not intended to completely replace professional treatment, they are an ideal solution for those who are unable to find a Shiatsu massage therapist in their area, can’t afford pricey Shiatsu massage sessions, travel a lot, or are too busy to visit a Shiatsu massage therapist regularly. Electric neck and shoulder massagers are also useful for managing pain and maintaining range of motion between professional treatments. Neck massagers come in many different designs and offer a variety of features. Below are a few things to look for in a good neck and shoulder massager. When you’re in need of pain relief, the last thing you want to do is waste time fiddling with complicated massage settings. When shopping for a neck and shoulder massager, look for a model that has simple, straightforward controls. Neck and shoulder massagers are covered with a variety of materials, including neoprene, synthetic rubber, and PU leather. Look for a massager made from a material that feels comfortable and won’t irritate your skin. If you perspire a lot, look for a massager covered in a breathable material like mesh. Not only does adding heat to your massage help soothe achy muscles, but it also helps boost circulation, improves cardiovascular function, and increases flexibility. The design of the electric massager is important, especially if you plan to use the device to massage other areas of your body, such as the legs, abdomen, or feet. A wraparound design with handles that allow you to adjust the pressure on different parts of the body will provide the most versatility. Electric neck and shoulder massagers vary widely in price. Those on the lower end of the price scale are generally not as effective or durable than more expensive models. Before purchasing a massager, it’s a good idea to consider your budget and needs. If you only plan to use the massager for a short period of time, a cheaper model may be sufficient for your needs. If you’re looking for a powerful massager that will last you for many years, you’re better off investing in a more expensive unit. For someone who is unfamiliar with all of the different types of neck and shoulder massagers currently on the market, choosing the right unit can be an overwhelming task. To help you choose the right massager for your needs, we’ve rounded up the best electric neck and back massagers available today. We’ve based these selections on ease of use, design, quality, price, and overall customer satisfaction. 2 massage directions. 3 speeds. 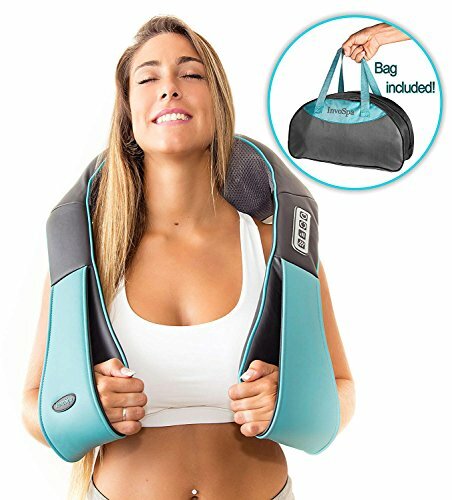 The FIVE S Shiatsu Neck and Back Massager features a wraparound design that allows you to use the massager around your back, neck, shoulders, arms, torso, legs, and feet. It has 8 massaging nodules that rotate in two directions and at 3 different speeds. It also has a heated massage setting, which is great for soothing sore muscles. A convenient car adapter is included in the box, making the FIVE S Shiatsu Neck and Back Massager a great option for anyone who’s always on the go. What we love most about the FIVE S Shiatsu Neck and Back Massager is its ease of use. All you have to do is plug the unit in and choose your desired massage speed and directions. We also like the handy automatic shut-off feature, which ensures you don’t exceed the recommended treatment time. In terms of performance, the FIVE S Shiatsu Neck and Back Massager is tough to beat. It delivers a deep, intense massage that mimics the hand movements of a Shiatsu massage therapist. Some users, however, have reported that this massager is too rough for their liking. Another common complaint is that the massager doesn’t get hot enough, even at its highest heat setting. 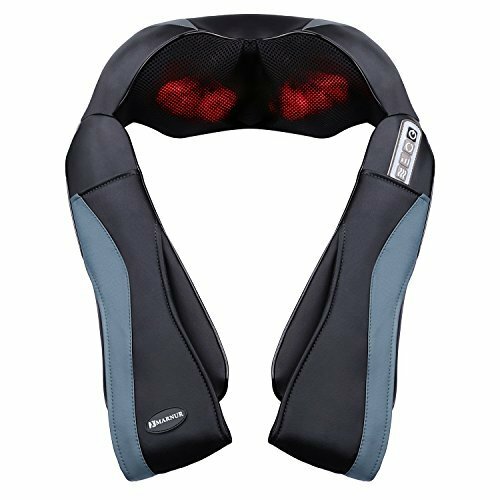 Overall, though, the FIVE S Shiatsu Neck and Back Massager is a great option for those seeking a lightweight, versatile, and portable neck massager that won’t break the bank. The Naipo Cordless Back Neck and Shoulder Massager features a similar wraparound design to the FIVE S Shiatsu Neck and Back Massager, with the addition of velcro straps that hold the massager in place and allow you to leave your hands free. The Naipo Cordless Back Neck and Shoulder Massager has a heated massage setting. Its cordless design makes this massager an excellent choice for anyone who wants to be able to continue their daily activities while enjoying the benefits of a deep Shiatsu massage. The secret to the Naipo Cordless Back Neck and Shoulder Massager’s effectiveness is its four 3D massage nodes, which are designed to deliver a deep tissue massage that is almost indistinguishable from a professional massage. Customers love the portability and versatility and hands-free design of this unit, although some have complained that the massager is less powerful when running on battery power alone. Others have said that the massager doesn’t get hot enough. Despite these minor complaints, the Naipo Back Neck and Shoulder Massager is a great portable device that can be used around the home, while driving, at work, or on vacation. Like the Naipo and Five S neck and shoulder massagers, the InvoSpa features a U-shaped design that drapes over your shoulders. It also has arm straps that allow you to adjust the intensity of the massage depending on which body part you’re massaging. Like the FIVE S Shiatsu Neck and Back Massager, the InvoSpa comes with a car charger adapter for use while travelling. What sets this massager apart from similar models, though, is that it uses infrared technology to produce a more consistent heated massage. We love the streamlined design of this electric neck and shoulder massager, which allows it to be easily transported. We also like that the unit comes with a carrying bag for added portability. The built-in straps do take some getting used to, however, and some may find the overall shape of the InvoSpa awkward. This massager provides a moderately intense massage, which can be effective in relieving mild neck and shoulder pain. If you’re looking for a unit that can give you a powerful deep-tissue massage, however, the InvoSpa may not be the right massager for you. 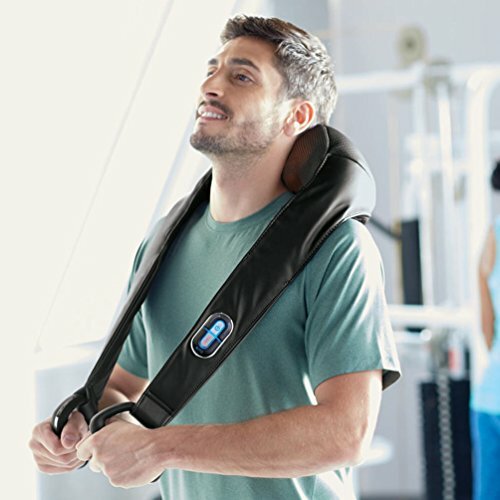 The Brookstone Cordless Shiatsu Neck & Back Massager is a heavy duty massager designed to bring maximum relief from neck, back, and shoulder pain. It features eight deep kneading nodes that help you target hard-to-reach areas, such as between the shoulder blades, and a heated massage setting for soothing tense, tired muscles. Two built-in loop handles allow you to easily hold the massager in place while massaging different areas of the upper body. The Brookstone Cordless Shiatsu Neck & Back Massager is equipped with a powerful lithium-ion battery that provides up to 3 hours of continuous use on a single charge, making this unit ideal for on-the-go pain relief. This massager provides an intense neck and shoulder massage that can aid in post-workout recovery and reduce the severity of delayed-onset muscle soreness. 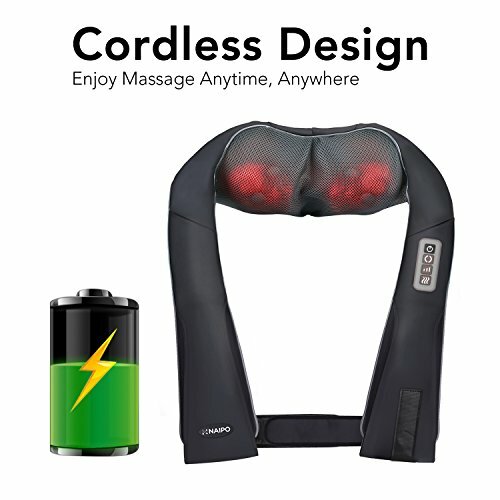 One thing to keep in mind is that the Brookstone cordless Shiatsu Neck & Back Massager is designed to be used on the neck, back, and shoulders only. Another important consideration is that the massager is quite heavy. Elderly individuals or those who have a limited range of motion in the neck and shoulders may find using this massager difficult. What sets the MaxKare Shiatsu Neck Shoulder Massager apart from the other massagers on our list is its breathable mesh cover, which allows for better airflow during heated massage sessions. Deep, kneading massage is provided by eight bi-directional nodes that imitate human touch. The included AC and car charger adapters allow you to enjoy a soothing massage at home, at the office, while driving, or anywhere else in between. 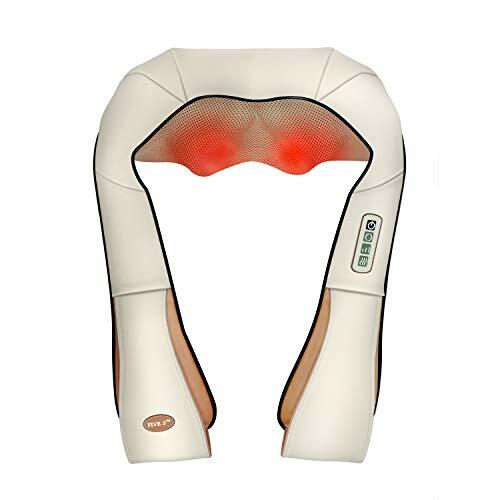 The MaxKare Shiatsu Neck Shoulder Massager features a contoured design that allows the unit to fit snugly against the contours of the lower back, waist, abdomen, and legs. That said, some users have complained of discomfort when leaning back against the unit. This massager does come with a 30-day money-back guarantee, though, so you can easily test it out before making the decision to purchase it. In the end I went with the Naipo Cordless Massager and have to say I absolutely love this thing! I don’t just use it on my neck and shoulders, but all over the body particularly the upper and lower back. When I’m sitting down in a chair, I’ll place the massager against the back of the chair and lean into it. It really has done wonders for releasing tension in my back. What I like about the Naipo massager is that it is powerful. When it comes to kneading my muscles I like to push very firmly against the nodules and the Naipo massager can handle the pressure I put on it without it stopping. This was not the case with the Maxkare version. Whenever I put even a little force the massager simply didn’t like it and would grind to a halt. The other good thing about the Naipo is it has a solid build and quality feel to the material. When I used the Maxkare version on my neck the netting seemed really rough and felt like it was scratching my neck, however the Naipo massager was very smooth and comfortable. That being said the Naipo massager isn’t perfect. One of the big selling points of the Naipo massager is that it is cordless. Whilst this function works very well, if you are like me and like to put a lot of pressure onto it, you do notice the massager being slightly weaker than if it was plugged in. Personally, I always used it plugged in, which kind of defeats the purpose of it being cordless, but I like the effectiveness of the massager so much that I don’t mind. The other issue I had is that there were a couple of faults in the products I received. The first Naipo massager’s stitching came loose quite early on into using it, and the second one seemed to have some charging options. When I first got my massagers I assumed they were all the same since they look almost identical (the Maxkare and the Naipo massagers even have the same box, the only difference being the brand name on it). However, the difference between the Maxkare and the Naipo effectiveness of massage is very different. As I stated already, the Naipo was more powerful, but also the nodules seemed to be spaced apart at a more effective distance for me. The Maxkare nodules seemed a lot wider apart, which didn’t really work for me, whilst the Naipo nodules seemed to be placed at a distance which hit the sweet spot. This example shows how one massager may work well for one person, and may not work well for another, and also highlights the importance of going for a brand with good customer service and a money back/satisfaction guarantee. Electric neck and shoulder massagers are generally considered to be safe, but you’ll still want to take a few precautions when using one of these devices. With any kind of neck manipulation comes an increased risk of injury to the spine. Here are a few tips for using electric neck massagers safely. Focus on massage frequency, not massage length. Shorter, more frequent sessions are recommended over long, intense massages. Most neck massagers have a recommended treatment time of 15 minutes. To ensure you don’t massage your neck for too long at one time, choose a unit that has an automatic shut-off feature. Remove anything around your neck before using your massager. Necklaces, scarves, and neckties can get caught in the massager and increase your risk of injury. Avoid using electric massagers on the front of the neck. Using a massager around the throat may result in carotid artery damage. Will It Beat Professional Treatment? Most likely no, however, factoring in price and convenience electric neck and shoulder massagers are a good alternative. Many people find these type of massagers very effective whilst some people find it simply isn’t for them. If you don’t find them effective then sometimes it’s down to not selecting the right electric massager, or you may need a different type of tool altogether. If that’s the case then consider a percussion massager, a shiatsu pillow or a manual back massage stick instead. There are many effective neck and shoulder massagers on the market, but the ones we’ve reviewed in this post provide the best value in terms of price, performance, and versatility. The information contained in this guide should help you understand all of the different features that are available so you can choose the best unit for your needs.